In 2002 Arab Strap's Aidan Moffat made one of the most beautiful electronica albums I have ever had the joy of hearing. Hypnogogia laid down thick, all consuming washes of sublime classical samples while slowly fading in the most delicate of beats. The contrast of the warm, earthy strings and these cold, electronic constructions was just perfect and gave the listener exactly what his ear and heart wanted to hear. 2004's follow up Touchpool employed similar tactics, the strings became more earthy and the beats moved more towards the foreground. The beauty was still there but somehow failed to seduce the same way it's predecessor did. It was almost as if the perfection of Hypnogogia didn't need to be improved or even followed. I wanted it to exist alone and this follow up, great as it was, was treading on hallowed ground. So next year we are to be treated to the next installment. 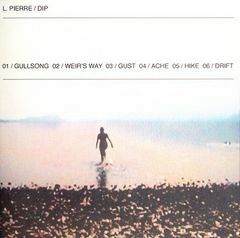 L. Pierre is not so much of a side project now - following the surprise split of Arab Strap - and "Dip" sees Moffat move his sound into new territory. "My favorite L. Pierre tracks have always been the quiet ones so I wanted to pursue that mood and record something gentle and lovely," he says. "I also took a shine to field recording and bought myself a little Minidisc recorder, which I took on holiday to record some natural ambience." "Dip" is a stripped down revision of the previous sound. It's as if Moffat has looked long and hard at his work and meticulously identified which elements are working and which to discard. The looped, sampled percussion has all but disappeared and the musical orchestrations that remain have a more organic, live sound. Nature plays a big part in this album. The sound of crashing waves introduces and concludes the record suggesting the infinite cycle of life and greatly contrasting the clinical electronica that went before. If Touchpool gave us too much of what we want, Dip does the opposite. The epic second track Weir's Way spends the first eight minutes on the most sublime orchestral wave then just as you think it's all coming to a close he hits us with the kind soft, synth beat that dazzled us before. The result is huge. He withholds this from us for so long that when he finally decides we are ready for it it's power is awesome. Except for the erratic drum beats of Hike this is all we get. The rest is majestic yet humble arrangements of cello, trumpets and keyboards and not a beat in sight. Dip is the sound of Man becoming Nature, city becoming country, land becoming ocean. It is the unequivocal sound of an artist stripping away the real from the unreal, the true from the fake, and though I am left in a frustrating state of dissatisfaction something in me understands why this was necessary.